Winter Park ski resort in Colorado needed to find an easier and safer way to transport their sleds from the bottom of the alpine slide track to the chair lift at the bottom of the the mountain. 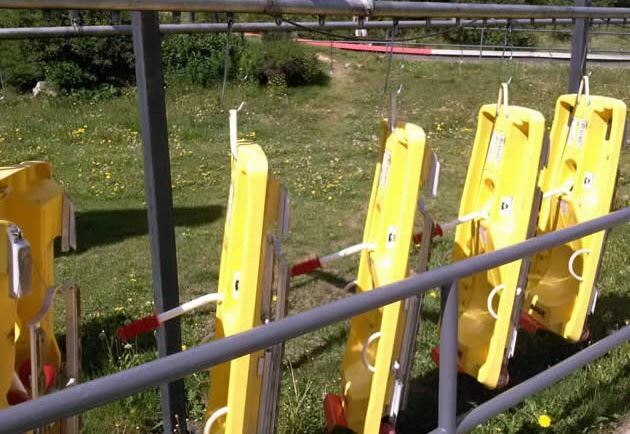 Here, the sleds would be placed on the chairlifts to take them to the top of mountain. However, since the top of the alpine slide track extended above the top of the chair lift, there was also a need to transport the sleds from the chairlift unload area to the very top of the track. 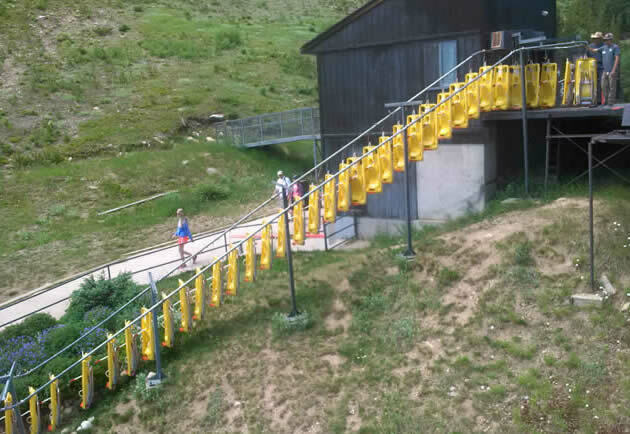 The solution for the Winter Park Alpine Slide was an overhead conveyor system designed by Pacline Overhead Conveyors. This type of conveyor system is typically used to handle automotive parts or to carry items through various manufacturing processes but has proven to be highly versatile and suitable for a very wide range of non-industrial applications. The PAC-LINE™ overhead conveyor consists of a 2 inch diameter round track which encloses the conveyor chain. For this application, chain pendants allow for hooks to be attached to hold the sleds. The hooks could then be spaced to match the timing of the ski lift chairs. The conveyor system installed for the Alpine Slide is powered by a simple ¾ HP, 120-volt single-phased motor. A key feature of the PAC-LINE™ enclosed track conveyor that made it ideal for this outdoor installation was that the track is zinc plated to prevent rusting and corrosion. Also, the round enclosed-track design protects the moving chain from debris. This track design also prevents the hands of operators or users from coming in contact with the moving chain which was an important safety feature. Finally, the PAC-LINE™ conveyor is very easy to assemble, track parts are bolted together with no welding required. This was particularly important for the Alpine Slide as the conveyor is disassembled and removed from the lift area each year at the end of the summer season. After more than 10 years of use, the original PACLINE conveyor equipment continues to run smoothly, carrying thousands of sleds up the mountain every year. Check out this video clip and take a virtual ride on the Alpine Slide at Winter Park Colorado!